Registration is online, and entries must be received no later than June 7, 2019 . Each artist may enter two pieces of art (any combination of 2D and 3D). The fee for entry is $35 for members and $45 for nonmembers. This year we are doing an online entry form. First, please review all the information on the Prospectus and use the link within to enter online. We look forward to seeing you at the show!! Judy Crane, 2D Judge Crane has worked as a professional artist for more than 30 years. 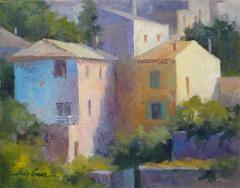 She shares her talents and knowledge by teaching a "plein air" style that is quick and yet deliberate. The focus is on shapes, values, color, and design. Crane captures the magical influence of light on the subject before her. Often this light is fleeting and illusive, other times bold and bright. For Crane it is the effects of light and the resulting shadows and color that inspire her to paint a subject. Oil is her medium of choice. Ronan Kyle Peterson, 3D Judge Ronan Kyle Peterson grew up in Poplar, NC, and attended the University of North Carolina at Chapel Hill. After college he took classes in ceramics at John C. Campbell Folk School and Penland School of Crafts. Ronan has taught classes in ceramics for 10 years in craft centers throughout the southeastern U.S., including Penland School of Crafts and Arrowmont School of Arts and Crafts. Ronan maintains Nine Toes Pottery, a ceramics studio in Chapel Hill, NC, which produces highly decorative and functional earthenware vessels. His work is drawn from processes of growth and decay in the natural world and translated into a ceramic comic book interpretation of both real and imagined phenomena. His ceramic vessels have been shown in local and national exhibitions and have been featured in both Ceramics Monthly and Clay Times and the books 500 Bowls and 500 Plates and Chargers, which includes an image of his plates on the back cover. This oil painting workshop will encompass all aspects of design as well as painting technique. The elements of value (degrees of light and dark) as well as shape, texture, and color will be used to develop paintings from photographs. Students are encouraged to bring their own photos though Judy will also have photos available. We will discuss how to choose a photo and crop it to make a better painting. Judy works with a fairly limited palette and will discuss color mixing and the benefits of cohesive related colors in creating a sophisticated painting. We will be using brushes and palette knives, and can experiment with cold wax medium if desired. We will work with shadows, keeping them interesting, colorful and lively, as well as reflections with techniques for making them feel “wet”. Cost of the workshop is AAS members:$340, Non Member , $360. Deposit of $150 due by May 15th. Deposit is non-refundable. Balance due June 16th.